While I am personally not a fan of email forwards, I do remember the impact some of them had on me in the mid-2000s. Does anyone remember the email that was circulating which claimed that Sheryl Crow said she got breast cancer by drinking bottled water that had sat in her car? Well, like most email forwards, it isn’t entirely true. However, I have read enough about the potential dangers of plastics to have some major concerns and hesitations about using disposable plastic bottles. Here is the latest factual information on the truth: Are plastic containers dangerous for your health? 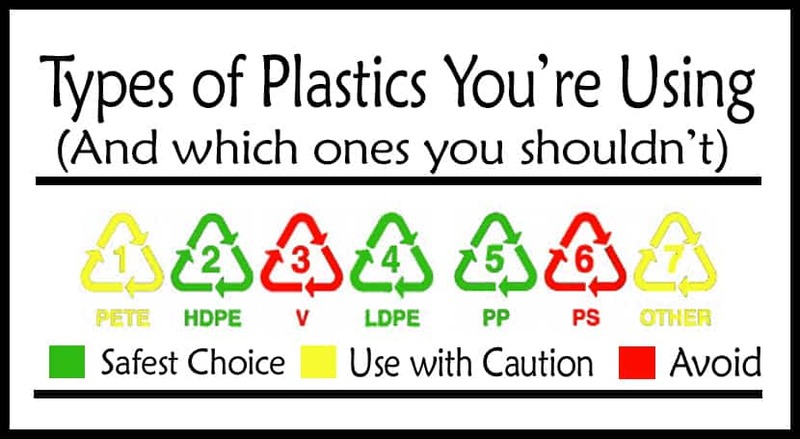 There are seven categories of types of plastic. From soda pop bottles, to plastic food storage containers, and even the toys our babies play with, plastic is everywhere. Some types of plastics are considered safe, while others should not come into contact with our foods. Here’s the low-down on the various types of plastic, where they’re found, which are safe, and which should be avoided. 1 – Polyethylene Terephthalate (PET, PETE or polyester). Health Concerns: Considered safe by the FDA. Contains antimony. In lab animals, long-term inhalation of antimony caused stomach pain, ulcers, diarrhea, pneumoconiosis (lung disease) and altered electrocardiograms (the heart’s electrical activity). (Source) It is not recommended to reuse PET bottles or containers, as harmful bacteria can build up. 2 – High-Density Polyethylene (HDPE). Common Uses: Milk jugs, motor oil bottles, soap bottles, bleaches and detergent bottles, and shampoos and conditioner bottles. Health Concerns: This type of plastic is BPA and phthalate-free, and doesn’t contain any other known harmful chemicals. 3 – Type of Plastic: Polyvinyl Chloride (PVC). 4 – Type of Plastic: Low-Density Polyethylene (LDPE). Common Uses: Frozen food packaging, squeezable bottles, garbage bags, plastic grocery bags, and the coating on milk cartons. 5 – Type of Plastic: Polypropylene (PP). Common Uses: Yogurt containers, baby bottles, microwaveable plastic containers, and plastic cups. Health Concerns: No known health concerns, however, it is advised to not warm up plastic containers in the microwave, because it is unknown whether this is a safe practice. 6 – Type of Plastic: Polystyrene (PS). Common Uses: Styrofoam, take-out containers, dairy containers, plastic cutlery, egg cartons, aspirin bottles, and meat trays. Health Concerns: The Foundation for Achievements in Science and Education show that small quantities of styrene found in polystyrene can have carcinogenic effects, fatigue, low platelet and hemoglobin values, and chromosomal and lymphatic abnormalities. There is evidence that exposure to styrene causes cancer in animals. (Source) Another study showed that women who were exposed to low concentrations of styrene vapors demonstrated menstrual disorders, metabolic disturbances during pregnancy and neurotoxic symptoms. 7 – Type of Plastic: Everything else. Common Uses: Some baby bottles, electrical wiring, 5-gallon water cooler bottles, and to-go coffee mugs. Health concerns: You cannot distinguish what type of plastic is being used, since it’s a catch-all for the rest of the plastics. Plastics may or may not contain BPA, which is known to leach into food products, and is an endocrine disruptor. The easiest way to determine what type of plastic is in your products is to flip the bottle/toy/container over and see if you can find a number 1 through 7 on the bottom. That can show you what type of plastic composition it has. Some older products won’t indicate the composition, so if you have concerns, I would recommend contacting the manufacturer for more information, or avoid using the product. The more I learn about various types of plastics and their potential hazards, the more I am determined to replace my household products with safe plastics or glass. Below are a few of my favorite products I have transitioned to. Cameback Glass Bottles are my favorite reusable water bottles. They’re durable, made from glass (no plastic concerns there!) and relatively affordable. Well-built and easy to clean, this is a great choice for home or the office. The initial investment of around $16 may seem pricey, but if you buy one bottle of water every day, you will recoup your investment in about half a month. You can find it on Amazon. I have nixed my plastic containers and replaced them with Pyrex Glass Storage Containers. They come in different sizes, and will out-last any plastic food storage containers I’ve ever used. Melissa and Doug create well-constructed wooden toys that are charming and fun for little babies and tots. They’ll weather much slower than throw-away plastic toys. You can see a variety of their creations here. I am a notorious food label reader, first because my daughter and I both have food allergies that require constant diligence, but also because I don’t like to put a lot of processed crap into my body, or my family’s. I try to make fresh whenever possible, and avoid pre-made items, but sometimes convenience out-weighs all of my best intentions. The other day, I bought a brand of organic applesauce, and have been taking it to work for a morning snack. After writing this article, I flipped it over and saw a glaring “7” on the bottom. This is irritating to me because I have gone to the trouble to find, and paid a premium for an organic product. Clearly, that should indicate that I am concerned about putting toxic chemicals into my body, yet the manufacturer of the organic applesauce puts the food into a potentially harmful containers. The bottom line is, you have to take your health into your own hands. Empower and educate yourself so you are equipped with the knowledge to make healthy decisions for yourself and your family. I, for one, will be flipping over packages from now on, and by-passing those products that don’t choose responsible packaging. Love your blog, and I truly appreciate the lifestyle changes you have and are making! Also, what brand of essential oils do you prefer please? Thank you again for being a hard worker at keeping your family healthy! Helps me stay motivated too! Thanks Mindy! I always love hearing positive feedback. As far as essential oils go, I used to buy from DoTerra, which has great essential oils, but I don’t agree with some of their recommendations, mostly the internal and undiluted use of essential oils. Mountain Rose Herb sells high-quality organic essential oils, and Essential Oil Exchange has a fantastic variety of oils, which have tested well, for a very affordable price. I hope that answers your questions. Thanks so much for visiting! Thanks for the information. I’m really trying to cut down on the chemicals in my life, but plastics can be so confusing! Stopping by from Natural Living Monday. Thanks for stopping by, Lynnae!